Remember this post? Although I am still terribly embarrassed at the quality of pictures on that dang blog, I will once more bring it up! Anyway, the jist of the blog is that over the summer I submitted a recipe for a contest one of my favorite bakeries was doing- Susie Cake's 5 Ingredient Recipe Challenge. And I won. HAHA. I was seriously shocked. I almost didn't even enter, but last minute went "Eh, what the heck.."
I realized I never got the recipe up here for you guys to see! I apologize for that. I guess too many things got in the way. But now as I think of it, this might be perfect timing...the pictures I took are very Christmas-ie...so bake some tonight! In one bowl, sift together the flour and salt. In a mixer fitted with the paddle attachment, add your butter and sugar and beat until light in color and fluffy (this is called "creaming"). Scrape down sides of bowl and add in vanilla extract and vanilla bean seeds. Mix again until combined. Next add your flour mix and carefully mix until just combined. You don't want to overmix in this step. Dough should come together in bowl and stick together when clumped with fingers. Turn dough out onto a sheet of parchment, and bring together into a disk. Pat flat. Cover top with another sheet of parchment and gently roll dough out until it is about 1/4" thick (again between the two sheets of parchment). Carefully transfer large flat disk onto a cutting board and place into refrigerator. Refrigerate until firmed up, at least 10 minutes. 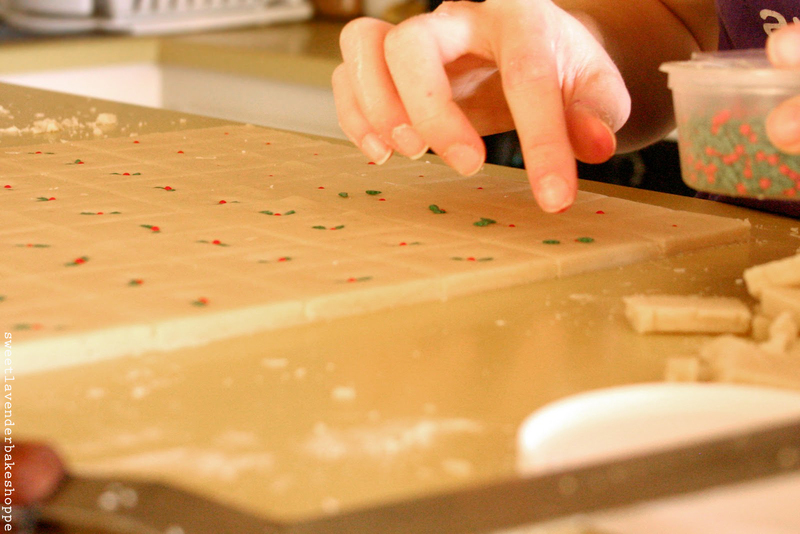 Line your baking sheets with parchment, wax paper or silpats. Remove sheet of cookie dough from fridge, move back onto a counter top, and remove top sheet of parchment. Cut out cookies however you desire directly onto that bottom sheet of parchment (of course making sure not to cut through the paper!) This eliminates the need for floured surface. Cookie cutting options include: cookie cutters, free hand with a knife or pizza cutter. I cut mine precisely into 1.5"x2" rectangles using a ruler and pizza cutter. I got about 30 doing it this way! Place onto sheet pan spaced out about an inch. If you want to add decorations like shown, now is the time to press gently into surface. Place back into the refrigerator to firm up once more, another 10 minutes. You can re-roll scraps and cut out more cookies with those scraps. Bake until firm, about 15 minutes checking after 12 to make sure they don't get too brown around edges. You want a very blonde-gold color around edges. Let cool completely on a wire rack and enjoy! I received a lot of inquiries as to where I found my holly decorations/sprinkles. I found them at my little cake decorating supply shop. I did find super close replicas online here, if you're wanting to buy some yourself! Simple cookies but I could eat 800 of them. 800!!!!!! Me too! I made them yesterday and they are awesome!!!! 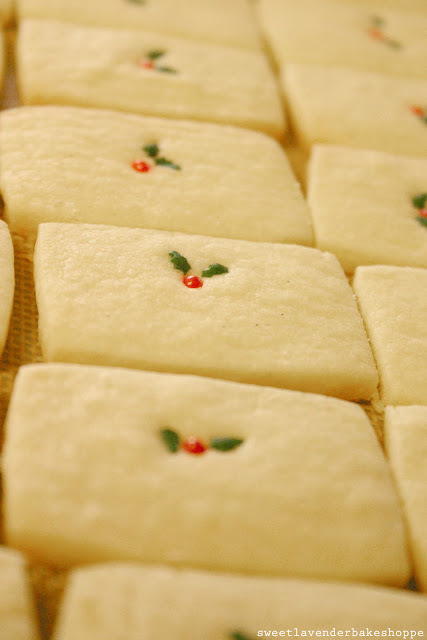 We have been making these cookies for many years - probably over 50 at least, since my Mom made them when we were young. Same exact recipe. They are great. In our family we call them Swedish Heirlooms. how do you make the leaves? what do you use to make the leaves? They were little holiday sprinkles with leaves and holly berries! My new husband is a pastry chef too! Nice to meet you...I'm your newest follower! Do you find that the vanilla makes a big difference in the flavor? 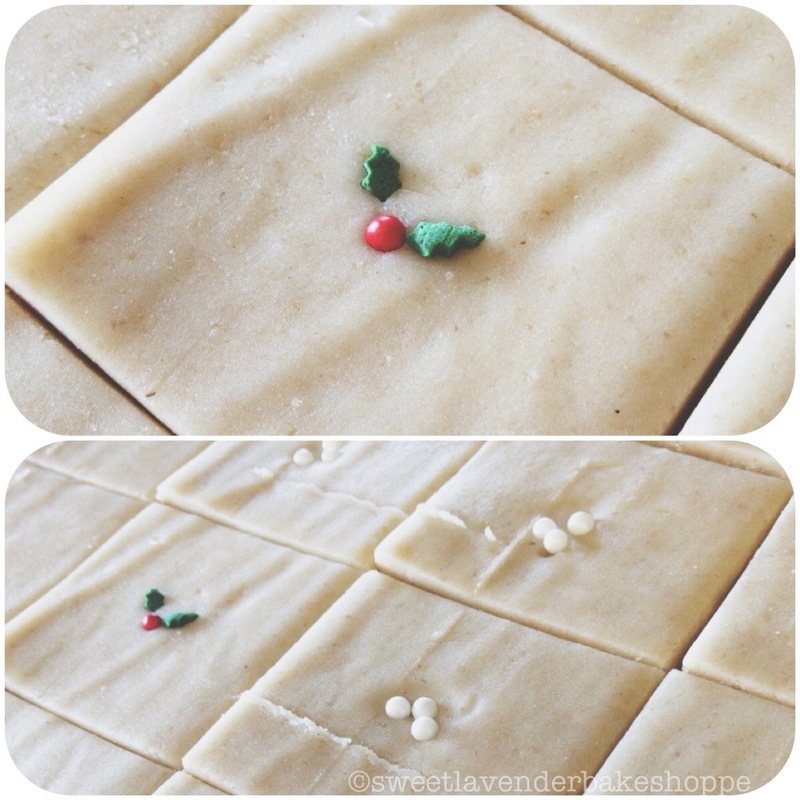 This is the same recipe that I use for shortbread but I've never added the vanilla before... I adore the little Christmas leaves and berries!!! Where do you buy the holly leaves and berries. I went to Michaels and they do not carry these items. Thanks I can not wait to make! I bought mine at a cake decorating supply store here in our town. You might want to check your town's local cake supply place? I'm pretty sure they're a seasonal item- so anytime from now till Christmas should be great! How much of the insides from a vanilla bean do you use? My instincts tell me that all of the inners from an entire bean has more power to the punch than 1 teaspoon of extract. For this recipe I would use about 1/4 of a vanilla bean :) Maybe a 1/3 if you're really wanting vanilla flavor! Could you use Castor/Caster sugar instead of confectioners sugar? We have a family member who is allergic to corn and confectioners sugar has corn starch in it. That's a good question! I'm not sure- you could certainly play around and see- but If my memory serves me right- castor/caster sugar is a super fine sugar- right? You'll more likely want to find something that more replicates powdered sugar- which has that starchy ness to it- corn starch, arrow root, more flour, tapioca flour, etc. Powdered sugar is basically sugar pulsed together with corn starch (as you know). BUt that corn starch helps in keeping the cooking stabilized and formed while baking- stiffens the dough. I know there are some good "homemade" powdered sugar recipes out there- http://www.fitday.com/fitness-articles/nutrition/healthy-eating/substitutes-for-powdered-sugar.html and http://wholenewmom.com/recipes/how-to-make-powdered-sugar-powdered-sugar-substitute/ to name a few. Hi, i'm in Canada and i'm wondering how much 1 stick of butter translates to...is it 1/2 c.? These are so simple but so BEAUTIFUL !!!!!! THANKS for Sharing!!!!! I am so looking forward to making these! They are going to be THE Christmas cookie I make for friends and family! I have searched all over for the holly sprinkles because they are the cutest things ever made, at least on these cookies. Wound up buying a cake pop decorating set just to get a few of them to use. Trying this tomorrow. Wish me luck! Oh bummer. I submitted a link to Amazon.com a few replies up. BUT they'll taste JUSt as good sprinkles or not! Good luck! Can I make ahead and freeze the dough? Absolutely! Just make sure you defrost the dough overnight in the fridge first! You may need to allow it to sit out on the counter 30 minutes or so to be able to roll out because of the deep freeze it was in. But totally freezable! I love making Christmas cookies! It was a tradition I had with my mother. I can't wait to add these to the list! I found these sprinkles in the dollar bin at Target.Score! I will be making these today. They are wonderful! We didn't find the holly & berries so used snowflakes & red/lime/green dots. Thanks for the recipe. It'll be a fav for years as you don't need to spend much $ on ingredients!! Oh you just made my day! It's actually not a dumb question at all!!! The reason bakers usually use unsalted butter (and then add salt) is because you can never be too sure as to how much salt is actually in that stick (or few sticks) of butter you're using for your dough/cake/etc. This way, by using unsalted (I prefer to use SWEET CREAM BUTTER even) and adding your own amount- you're in control and you can 100% make sure your dessert doesn't taste too salty! You certainly can freeze the dough! I would either make the dough, form into a flat disk (like you would pie dough), wrap in plastic and freeze. OR make dough, roll out, cut cookie shapes, lay flat on sheet pan and freeze until solid. Then place frozen cookies in an air tight container in layers separated by wax paper or parchment, and store in freezer. If stored in freezer already cut out, all you need to do is simply place frozen cookies on a sheet pan and bake (time will vary a tad because they're frozen as opposed to not). If you decide to store disk of dough in freezer, simply allow to thaw in fridge overnight and then allow to sit on counter 20-30 minutes before rolling out! Then cut shapes and bake accordingly! Awesome!!! Its a perfect recipe for that! You got me at the 6 ingredients – everyone needs a good and easy chocolate cookie recipe, and this definitely looks like one, thanks for sharing! 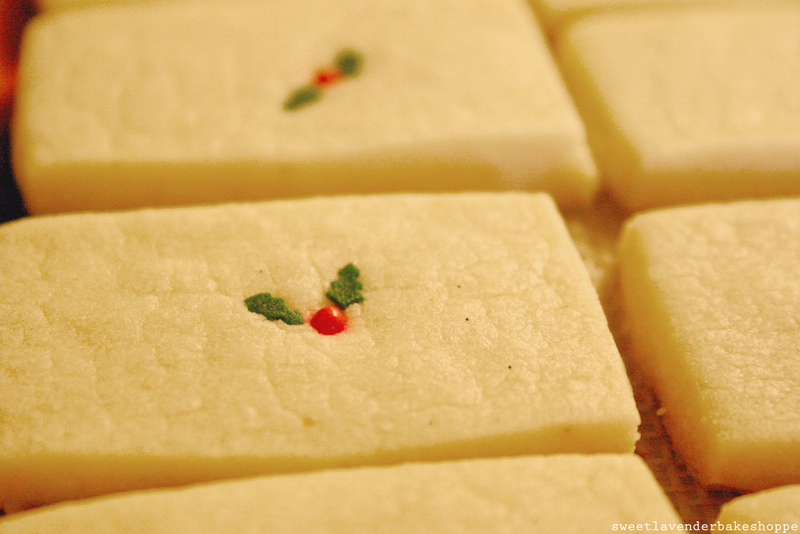 Definitely going to make these for a change as I make shortbread every year. Love the simple decoration. Our family hates frosted cookies...thank goodness! a few questions: 1) can I make the dough a day before and refrigerate then roll out the next day? 2) can more than one pan be baked at a time (on different racks)? 3) if I use vanilla bean do I still put in the vanilla extract? Thanks, hoping to get answers to a make them this weekend. Hi Mary! Let me try and answer your questions as best as I can! 1. Yes! You can totally make the dough a day before. I would recommend patting the dough into a nice flat, 1" disk before wrapping in plastic wrap and placing in fridge. This way, your dough will thaw out and soften to room temperature nice and evenly. On the day you want to bake, remove dough from fridge and allow to come to almost room temp on a kitchen counter. Roll out on a floured surface as usual. 3. That's up to you. It definitely wouldn't hurt. But you also don't need to if you don't want to. You can also just stick to the extract and forego the beans if you'd like- I know extract is a bit cheaper.